On Friday, May 12, a group of volunteers from Huron Consulting joined our Work to Play and Take the Lead participants on the grassy fields at Prieto Math and Science Academy. Urban Initiatives student-athletes from Prieto, Morton, and Ravenswood came together for an afternoon of soccer and friendship. The sun warmed the fields, and parents gathered on the sidelines on the beautiful spring day to cheer on their children. The students formed smaller teams and scrimmaged throughout the afternoon, in many cases playing alongside the volunteers. 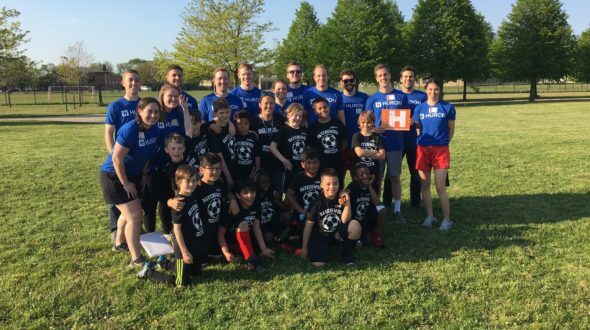 The afternoon concluded with a giant soccer game in which all the volunteers and students from Ravenswood faced off on a single, larger field. Volunteers and students alike displayed heroics and soccer skills, with different players scoring goals. Thank you to the amazing volunteers from Huron who spent their day of service with Urban Initiatives!